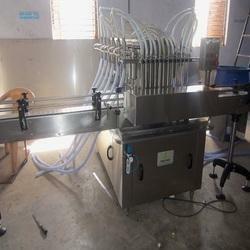 With rich industry experience and knowledge, we are offering an assorted gamut of Automatic Liquid Filling Machine. 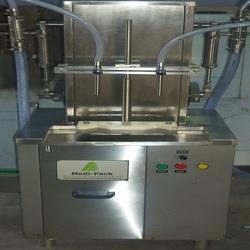 The offered machine come with automatic operation and can be provided with multiple muzzle support. 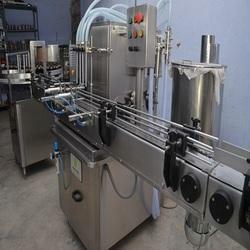 Our machine is integrated with the features like compact designed finish, makes use of continuous vacuum suction support, liquid level of the vessel determined through depth of vacuum port within neck of vessel, ensures consistent liquid level, and provides for superior bottle positioning accuracy. Manual Bottle Filling Machines offered comes with latest technology support and come with suspension type clip bottle mouth for reliable process handling and stable operation support. Further, these systems allow for high-speed operations and require simple adjustment of conveyor for different bottle heights. 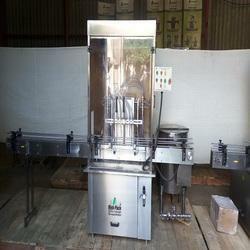 Some of its features include guide rail support for turning of bottles, based on normal pressure filling technology, allows for fast, reliable and non-drip filling support, no bottle no filling working, provides for constant torque of screw cap, offering tight and reliable sealing support, advanced man-machine interface operation including variable frequency stepless speed regulation. Semi Automatic Volumetric Liquid Filling Machine offered come with multiple filling nozzle support and adopts advanced setting and inject method for precise operations. Further, the free left and right movement also makes these allow for superior adjustment support. Some of its features include advanced PLC support for precise functioning, machine comes with alarm support for any interruption related to packaging, touch screen support, allows for steady filling with no overflow, allows adjustment of speed as per requirement. Automatic Liquid Bottle Filling Machine offered can be made available with multiple head choices and come with advanced programmable logic controller as well as human and machine interface technology so as to offer optimum performance support. 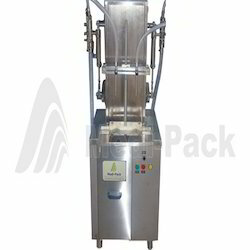 Further, these filling machines come equipped with advanced photoelectric track switch that finds suitability for handling filling requirements of products like syrup, shampoo, fruit juice and others. Some of its features include automatic insertion of filling nozzle into bottle for rapid filling operations, comes integrated with support of electric and pneumatic functions, provide for stable performance, automatic bottle feeding support among others. • ± 1% Filling accuracy on single dose. • No bottle No filling system. • Rigid vibration free construction for trouble free performance. • S.S. Elegantly matt finished body. • Elegant and easy control panel for total control on operation. • Minimum change overtime, from one size to another container or fill size. • Self lubricating UHMW-PE guide profile for SS slat chain provides low friction wear surface, smooth and noiseless conveying. • Error code display on AC frequency drive on control panel. • Drain tray around machine platform. • Drip tray under the conveyor. • Pneumatic bottle stopping arrangement. • Synchronized two nos. A/c drive for main motor conveyor belt. • Safety guard for conveyor gear box, motor and pneumatic cylinders. • MCB for over load protection, and prevention against short circuit. • Inbuilt protection against over current, Voltage fluctuation, Short circuit in AC Frequency drive. Liquid Bottle Filling Machine offered come with latest electrical component support and assure of complete equipment reliability and high accuracy performance. Further, the touch-style user interface also provides for safe and reliable operations. Some of its features include quality mechanical performance, use of non-toxic corrosion 316 stainless steel components, advanced PLC control system for precise operations, suitable for use in areas like oil, chemical, sauce and others, ideally suited for high viscosity fluid filling operations. Manual bottle filling machine offered find extensive use in industry sectors like food, pesticide and other industry sectors and features advanced pneumatic parts for precise operations. Further, these machines come with cylinder piston and hopper support in stainless steel finish for lasting performance. Some of it features include machines developed as per GMP standards, adjustable filling range and speed, leak proof filling unit, accuracy of ±1%, filling volume of ≤1000ml, air pressure of 0.5 to 0.7Mpa and others. 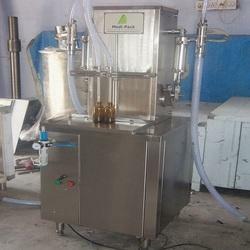 Semi Automatic Liquid Filling Machine offered provide for accurate performance involving measuring and dispensing of free flowing and paste products like thin/dense liquids. Further, the support of multiple volumetric pistons also assures of high production capacity as well as precise operations. 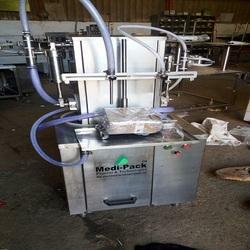 Some of it features include product that needs to be dispensed is done through simple adjustment of length of piston stroke with reduction in stroke reducing volume dispensed, 304/316L stainless steel construction, sanitary tri-clamp connections, all pneumatic operations, suitable for use in industry sectors like Food & Beverage, Cosmetics, Pharmaceutical and others. 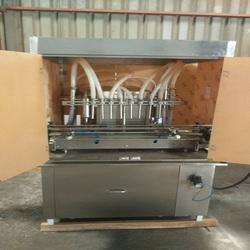 Volumetric Liquid Filling Machine offered comes with latest technology support and provides for flexible operation support. Meeting the demands of accurate filling of different viscosity liquids, these filling machines comes manufactured using 304 stainless steel frame for lasting performance. 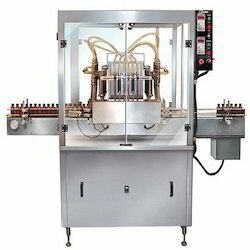 Some of its features include available with multiple nozzle support, comes with PLC control and touch screen support, stainless steel and anodized aluminum construction finish, no bottle no fill operations, accurate filling volume within ±1%, easy to maintain system, diving nozzles for bottom up filling of products and others. Bottle Filling Machine offered provides for linear type filling support as well as ensure accurate performance with no bottles no filling operations. Further, the machine also matches with GMP standards and finds use in filling and screw-capping of 20 to 500ml glass/plastic bottles in any shapes. Some of its features include delivers accurate filling volume, suitable for metal cap, pilfer-proof cap, screw type cap; allows for easy operation and maintenance; filling tolerance of 0 to 2%, power supply requirements of 380V, 50HZ.